What this piece might look like if it were a poster, under a black light. Remember owning one of these? 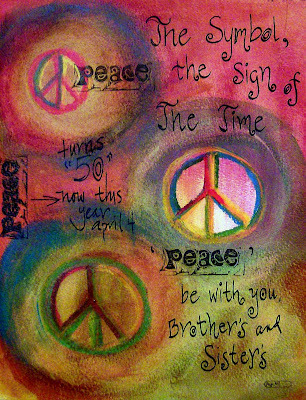 The PEACE symbol turns 50 years old, this April on the 4th day, 2008. "This symbol was created by a British pacifist textile designer, Gerard Holtom and made its debut in London's Trafalgar Square where many gathered to support "ban the bomb" movement and to march to Aldermaston where atomic weapons research was being done." It was originally designed for the DAC (Direct Action Committee Against Nuclear War) and was adopted as its badge for the CND (Campaign for Nuclear Disarmament) in Britain. It was later generalised to be an international icon for the 1960's anti-war movement and adopted by the counterculture of the time. 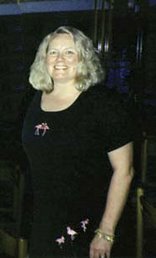 These were the times, I was present, young and impressionable. 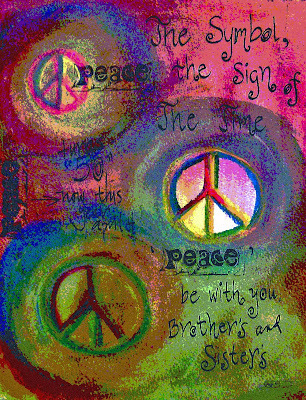 To all my friends may you find some peace on the road of life. Yes, it was an amazing time to be in the wings - impressionable - and at the cusp of adulthood. Great post, again. Black light Pax. Great homage. Love the bright colors and the circles! Wonderful post about the Peace sign! beautiful! and peace back at you! Rent Across the Universe....the DVD. I still have it out from Library, although I must admit Marie, a Beatles fan, can watch 30 minute parts only. Summer of love will be 41 this year. Sometimes it is hard to come by, peace - vrede. I search and sometimes find, then lose it again and search some more. I second all that was said! And yes, I recommend Across the Universe!!! Andrea, I love this.. I remember my brother and sisters during this period. They were very against the war and was into peace. The Beatles... There was an album of theirs with a green apple on it that my brother played all the time but I can't remember the title of the album. I LOVE Cat Stevens.. Reminds me so much my brother. I hope you are having a good weekend. I am doing a post about you later this evening. Great post and Gorgeous work! Color to die for! I love this post :o) Drawing, text and videos. PEACE what a concept nowdays huh? Oh I am glad to have been part of this generation of enlightenment. Now if the world would just work on the idea of peace. Wouldn't it be a happy place,like your blog page is. Andrea, come pick up the Blog of Distinction Award over at my place.